So, 2018 was a huge year for jewelry. We finally started seeing the return of heritage pieces like tennis bracelets, herringbone chains, and charm bracelets, which felt like a nice break from the exclusively minimalist world we were living in for just a tad too long. The next style to buck that trend is turquoise jewelry, which has made a triumphant return to the spotlight. Somewhat surprisingly, both the fall and spring collections of jewelry designers from all over the map contained some variation of the stone or color. In order to get some more information on the return of this old-school jewelry trend, I reached out to a handful of jewelry designers for their takes. 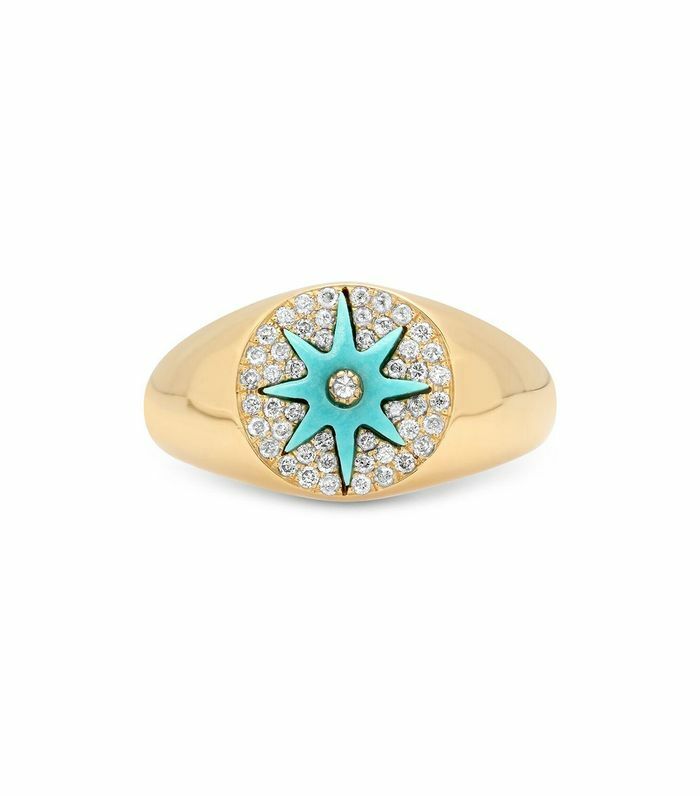 A majority of the quotes are peppered throughout the shopping roundup below, but there was one from well-known jewelry designer Anna Sheffield that stood out from the rest, providing a well-rounded view of turquoise as a jewelry trend in 2018. "Turquoise, though timeless with its glamour, reaching from ancient Egypt to the American West, has its moments in every day and moments in vogue. I think currently, this beautiful blue gem is having a moment in the spotlight," says Sheffield. "I love to see it done in a new way, especially having grown up in the Southwest. So in my collection, I show it two ways: Reinvented and reprised, taking vintage pieces like these Sunburst earrings and adding a dash of gold and champagne diamonds for extra flair, and modernized, in a simple setting, like a classic three-stone ring, and instead of treating the turquoise like a semiprecious stone, it's handled in the same way as a fancy diamond." Below, you'll find a curation of the turquoise jewelry trend that is diverse enough in taste to suit everyone's personal style. Along the way, don't forget to check up on some of the biggest jewelry designers in the industry's take on the return of this trend. Next up, shop 20 simple pieces of jewelry you'll never have to take off.